Association of Chartered Certified Accountants (ACCA) and Chartered Accountants (CA) are both connected to accountancy. 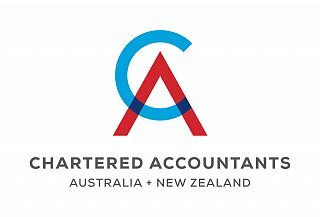 What is Chartered Accountants (CA)? Chattered Accountants (CA) is a certification awarded to people with qualifications in accounting. People granted this certification can offer accounting and financial services in businesses operations which include; taxation, auditing, financial management, and general management of the enterprise. To remain, the chartered accountants’ institute requires its members to continue with a minimum level of professional development so that they can maintain their competitiveness in the dynamic world of business. What is Association of Chartered Certified Accountants (ACCA)? ACCA (Association of Chartered Certified Accountants) is a global association of professional accountants, which has its headquarters in the United Kingdom. The body has tremendously grown to exert its influence at the worldwide level with members in all parts of the world. Members are required to have accounting qualifications and practical work experience before handling ACCA qualifications before they can register as members of the association. One of the primary difference between CA and ACCA is their foundation periods. ACCA was founded in 1904, which means that the association has been in operation for about 114 years making it one of the oldest accounting bodies in the world. ACCA has its headquarters in London with its principal administrative office in Glasgow, Scotland. Besides, the association works by use of a network of 100 offices with more than 7,200 employees spread across the world. Chartered Accountants (CA) certification was initially established in 1854 by chartered accountants. The primary mandate of the members is to offer technical support and advisory services to various business activities while at the same time ensuring business development. Members of ACCA are qualified accountants who may have their practice for some years, which means that they can register their tax and auditing companies where they practice their professionalism under the guidance of the body. Chartered accountants are considered as accountants for hire where they provide fee-based services for organizations in the public and private sector. Some of the functions of the chartered accountants in the private sector include wealth management of a company or individual and overall financial supervision of an entity. The expertise and experience of chartered accountants tend to revolve around business functions hence making them have higher chances of upward mobility and lucrative salaries associated with their high demand. The membership in Chartered Accountants (CA) and ACCA are significantly different. Current statistics indicate that the body is a rapidly growing qualification in the world with more than 500,000 members and students around the world. Additionally, the agency has its roots in 170 countries. On the other hand, members who have been awarded a certification to practice accounting as chartered accountants are steadily growing. The United Kingdom and other Commonwealth countries have their respective Institutes of Chartered Accountants with a significant number of members in each institute. For example, the Institute of Chartered Accountants of Australia has 61,000 members and the Institute of Chartered Accountants of England and Wales has more than 147,000 members. To be a member of either the Chartered Accountants (CA) or Association of Chartered Certified Accountants (ACCA), a specific criterion for eligibility must be adhered. One of the fundamental requirements is that an individual must have professional training in accountancy. However, to be a member of the Institute of Chartered Accountants of Australia, England and Wales, and other Commonwealth countries, one is required to complete the ‘Chartered Accountants Program.’ This program includes a graduate diploma of chartered accountants and 450 days of practical experience mentored by the Chartered Accountant (CA). To join the Association of Chartered Certified Accountants (ACCA), one is required to possess a professional foundation in accountancy, preferably a university degree in accounting and two sections of ACCA exams. In addition, three-year work experience is required before one can be eligible for registration. Although both CA and ACCA have members with similar knowledge and expertise in accounting principles, their preference in the market significantly differs due to the qualification methods. Major accounting firms in the world, which include Ernst & Young, Deloitte & Touché, Arthur Anderson, and KPMG among others currently, prefer members who have undergone through the Chartered Accountants Program because it is a rigorous pathway. The program has been known to provide candidates with industry-leading training and knowledge, which is designed to send them ahead of the pack. This does not mean that members of the ACCA rank low on the preference list. Some institutions prefer candidates who are members of this association while other countries have structured their accounting policies such that they only favor members of ACCA. Although CA certification and is a member of ACCA lists one as an expert in taxation, auditing, and wealth management, the model of making one a chartered and certified member of ACCA is preferred in some countries because it provides additional knowledge of United Kingdom accepted accounting principles (GAAP). Moreover, a member of ACCA has expertise knowledge in international accounting laws governing International Financial Reporting Standards, which puts a candidate eligible to work for Multinational Firms or international clients. Chartered Accountants (CA) is a certification that is awarded to accountants with accounting qualifications who have undergone the chartered accountant’s program, which includes a graduate diploma and a stipulated work experience. Association of Chartered Certified Accounts is a body that has its members drawn from professional accountants who undergo qualification programs and work under close supervision of the association. Other differences between CA and ACCA include the year of establishment, professional practice, membership, qualifications, general preference, and knowledge differences among others. Jecinta Morgan. "Difference Between CA and ACCA ." DifferenceBetween.net. 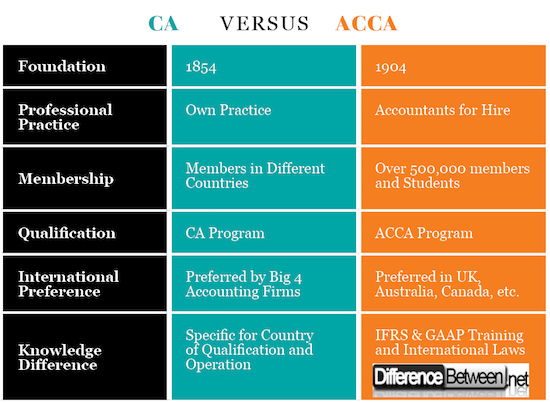 March 13, 2018 < http://www.differencebetween.net/business/accounting-business/difference-between-ca-and-acca/ >. CA exam is the supportive role for ACCA exam? If I complete my CA then for the further education I can choose ACCA exam for better qualification and manager post in the audit. Thanks for sharing your points. For your point I decided to go with ACCA, the ACCA consist all point such as Taxation, Audit & Assurance, Financial Management, and Corporate and Business Law which is good for an accounting position. Alexander, David, Anne Britton, and Ann Jorissen. International financial reporting andanalysis. Cengage Learning EMEA, 2007. Clatworthy, Mark, and Michael John Jones. "Financial reporting of good news and bad news: evidence from accounting narratives." Accounting and business research33.3 (2003): 171-185. Sian, Suki, and Clare Roberts. "UK small owner-managed businesses: accounting and financial reporting needs." Journal of small business and enterprise development 16.2 (2009): 289-305.